Throughout the last week, anytime stocks have begun to correct or drop, “someone” has bought S&P 500 futures to prop the market up. Anyone who’s been involved with the markets for a while knows the difference between real buyers and manipulation. This is manipulation plain and simple. Look at all those “V” rallies. Three days in a row stocks opened DOWN and someone immediately stepped in and began buying aggressively. Another tell-tale sign of manipulation: the buying halts almost the moment stocks get to 2,100 on the S&P 500. At this point the manipulation ends. 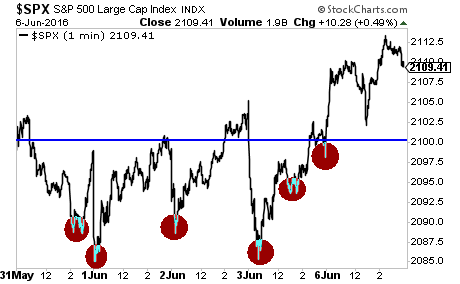 And because there are few REAL investors buying stocks at these levels, the market immediately retreats. Could it be that the Fed or Plunge Protection Team is aware that earnings are collapsing… signaling that this stock market bubble is ready to burst? The Fed is not buying - they would have to disclose it on their balance sheets, and there are no stocks there. They did buy a lot of bonds, the bonds are all on their balance sheet, and they give the interest payments to the UK govt. The effect you are notice is programmed bot trading. Regardless of where volume is coming from, it will always be temporary. Prices can only be lifted, or suppressed, for so long. Either prices drop to reflect earnings/data or they are predictive of better data ahead. However, given where interest rates are, its not all that surprising to see stocks at these high of valuations, especially if consensus believes rates are on hold for the foreseeable future. Just look at how much margin debt investors have taken out to buy stocks over the last few years (myself included). I agree the market is likely overvalued. I've been decreasing exposure with every leg up. I'm not ready to switch from stocks altogether altogether though. While data has been muted, leading and coincident indicators have yet to trend together into negative territory. In any case, it's a process of time and not so much a 'burst'. Now is probably a good time to explore other markets or assets that haven't run up so high in recent months/years. Perhaps gold/silver or foreign markets of less indebted nations? Hello, I know this is a random question and I apologize for dropping it out of the blue but we were wondering if you would have any interest in delegating any SP to @steemwizards in exchange for steem? We are trying to help the educational community to grow by rewarding high quality educational posts. If you want to see what we are doing, please check out @steemiteducation blog. You will see that we are voting on all of the selections they resteem and feature in the blog. We are also voting a few humorous posts if we have left over SP each day. If this isn't something you are interested, thank you for your time and we are sorry to have bothered you. Hello sir I am new in this platform . So please help me . Just follow me back please.